Mozart’s piano concerto number 23, K488, adagio is played twice in Luc Besson’s The Lady. Last evening I watched Luc Besson’s “The Lady” at the Maui Film Festival. I had read about Aung San Suu Kyi over the years but never quite understood why she was kept under house arrest in Burma and separated from her family in Oxford. The movie educated me to her cause and touched me greatly. I was particularly moved by her son Alexander Aris’ acceptance speech of the Nobel prize on her behalf. The two classical pieces of music were played twice. Mozart’s piano concerto and Pachelbel’s Canon in D will now take on a new meaning for me. As I have been collecting different arrangements of the latter, which suffice material for a separate blog, allow me to indulge in Mozart. The second movement of Mozart’s piano concerto number 23 (also known as the Adagio from K488) played by soloist Maurizio Pollini was poignant and at the tempo I preferred. I had heard it on a CD broadcasted at my late composition teacher’s funeral this past August and thought it too fast. If you haven’t heard of this concerto, compare the faster version of Horowitz with the slower of Pollini. See how the tempo affects the mood. My duo has played our own arrangement on various occasions. The piano is the solo, accompanied by the guitar as orchestra. It’s one of my favourite slow movements of piano concertos. We’re always arguing over the right tempo for this piece. Note: Scores for full-orchestra, 2-piano version, and 4-hand duet can be downloaded for free from the Petrucci Library. In the context of the movie, Mozart’s Adagio conveyed sadness and death. Earlier in the movie The New World, it conveyed one of unrequited love. For me, it will always be a beautiful work — one that can be played as a piano solo. The piano and the guitar are not only very different, the way the respective players are also different. Compare this to desktop computers and laptops. As I admire my sister’s water color of piano and guitar on my wall, I can’t help noticing how different the two instruments are. One is transfixed to the location. The other is portable. One has 88 keys. The other has 6 strings and many frets. The players are different, too. As a pianist, I don’t carry my instrument. But I have to adapt to the instrument at the venue. Sometimes it’s a pleasant surprise. Sometimes it’s not so nice. Nearly always I have to get used to it. Does the soft pedal work? Do I have to open the lid? How does it sound with the guitar? How does it resonate in the room? As a guitarist, Robert always carries and plays his own instrument. He knows his instrument like the back of his hand. The only things he needs to adapt to are the piano at the venue and the acoustics. Compare this analysis to road warriors who require computers to work. As convenient as laptops are, they still require carriage, taking out of the case, plugging into a wall socket, opening up, charging, etc. There is a risk of theft and damage. A laptop takes up space. For all these reasons, I prefer desktop computers. I carry a memory stick (flash drive) and/or I load my files on Google Docs or web directories. I can log into any internet-connected computer and get what I need. I am the quintessential pianist who would rather adapt than carry. Meanwhile, the guitarist is accustomed to carrying his instrument. He will use a laptop or an ipad or an iphone. This is not to say that I don’t use a laptop. I have a laptop — an old powerbook G4. It sits on my desk like a desktop. Playing music for senior citizens on an electric keyboard is not the same as on an acoustic piano. Live music has positive effects on alzheimer sufferers. What does it take to get a real piano into an elderly home like Roselani Place in Kahului, Maui? For Mother’s Day and Thanksgiving Day, I brought my 70-something mom to Roselani Place to celebrate with the residents. I played the electric keyboard while the residents and their guests enjoyed their chef-cooked luncheons. Music has an amazing way of uniting people when they recognize tunes they know and start humming. Some came up and thanked me afterwards. I love looking for music to play for an audience. For both luncheons, I had borrowed several volumes of sheet music from the local library: music from the ’20s, ’30s, and ’40s. Because of the diverse ethnicities of the residents, I even included the popular “Sakura” and Hawaiian songs. I wanted to play them the way I prepared them on the grand piano I practised on. Unfortunately an electric keyboard, despite its bells and whistles, is not an acoustic piano. Once the restaurant was filled, the people in the back could not hear me. I had cranked up the volume to the max. I tried fiddling with the instrument selection. A harpsichord sound was surprisingly louder than the “grand piano” selection. I tried synchronising a drum beat to it. I could not increase the overall volume. When I first visited Roselani earlier this year, I was eager to try the upright piano in the reception area. I quickly learned that the entire treble half was long gone. Unstoppable, I moved to the bass half and continued to play. Somebody switched off the piped recorded music. The residents started to listen as if finally awakened from their reveries. The piano was different from the constant music coming out of overhead speakers. There was a person at the piano. Knowing that they were listening changed the way I played. It was no longer practice but performance. I know for a fact that live foreground music is much more effective than recorded background music. In my research into programming live music for the elderly, I learned that live music is therapeutic for alzheimer sufferers. Just google “alzheimer music” and see the evidence. I have seen a passive audience come alive when they see and hear a live concert. Even if they cannot speak or recognise me, I can see life in their eyes and feel the firmness of their hand grip. In years of playing in such homes throughout the Netherlands, my piano guitar duo has revised our repertoire to choose what works best. The staff and volunteers at such homes know that the choice of music directly affects how well the residents sleep at night. What will it take to move a working piano to Roselani Place? Fundraising to get a piano in there? Roselani Place is a 501c organization. This is a form of savings for anyone who is leaving the island but is stranded by a piano they can’t sell should consider donating to Roselani. They can deduct the value of their piano against their income tax. It’s a last resort, unless they are prepared to pay for storage or leave it with a tuner or music store for sale on consignment. I suppose one way to find out the attractiveness of my proposal is to monitor Craigslist. How long does it take before a piano gets sold? Or perhaps I should ask a piano tuner or technician. Anne Ku looks forward to teaching an adult group piano class in January 2012. 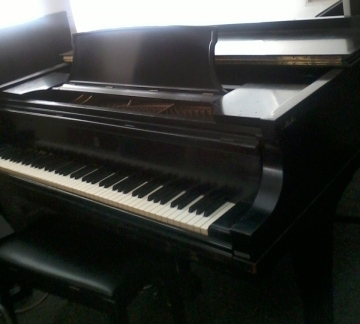 Starting 11th January 2012, I will be giving a 3-hour evening piano class once a week. There are three course codes for this college-level class, each corresponding to a different level of playing. I will find out on the first day of class when I get to know the students just what their playing, reading, and hearing abilities are. The 20 students will have to procure headphones to plug into their electric pianos, and I will teach them individually. This will be very different from the individual private piano lessons I have been giving at home in the Netherlands and elsewhere. I can’t rule out those that are starting completely from scratch. They simply want to learn how to play the piano without having any previous music education or experience. For them, I found a blog post containing tunes one can play on one hand. As the students are adults, I will also look for sites with tools and resources for adult piano learners. My first step is to get them comfortable at the keyboard and recognise the 2-3 cluster patterns of black keys. Next I will get them to look for a note and find similar notes several octaves apart. Ultimately they will want to play tunes they like. Here is where playing by ear is important. As it is a group class, I look forward to having my students play together at some point. The more advanced players will play more advanced parts. I will get them to improvise. There are so many possibilities!! Surfers and Performers: a parallel universe? A musician notices parallels in the worlds of surfers and performers. Recently I came across an article entitled “The Surfer’s Guide to Personal Development.” The author Svrinas Rao, obviously a surfer, talks about lessons he learned as a surfer and how they apply to life. Being a newcomer to the surfer capital of the world, I can’t help but be fascinated by the surfer culture here: the lingo, the way surfers check weather forecasts, the intricate network in which surfers monitor the waves and call each other up for updates. I’m intrigued by how keen they are to get up before dawn to catch a wave and how they talk enthusiastically about it afterwards. How does this relate to the world I’m from? Musicians have our own language. We get information about gig opportunities from other musicians or from participating in certain projects and ensembles. We observe certain etiquette — the way seasoned surfers acknowledge the line-up. Each concert is a real-time experience, just like catching a wave. Each wave is different. The acoustics are different. The audience is different. We have to be able to anticipate and cope with uncertainty. We embrace the unknown. Rao talks about “being present.” He translates this to mean “focus on what you’re doing now.” As performers, we can’t afford to be distracted by movements in the audience or unexpected and annoying flickering of light. We have to focus on the music, our playing, and delivering the best. In his earlier article, Rao wrote “timing can make the difference between a great ride and a severe wipeout.” For us chamber musicians, it’s all about timing. That’s why we first establish the tempo and the rhythm. We have to be in sync even when we are slowing down, speeding up, or doing a rubato. Here on Maui, I’ve seen men greet each other not just as teacher to student or salesman to customer but also as surfers who have shared a morning together. There is a comraderie built from years of surfing from the same beach. Perhaps these surfers who go to Utrecht, Netherlands will notice how my fellow musicians greet each other, from years of performing together. Click here for a live webcam from Mama’s Fish House at Hookipa, Maui. Click here to read a sociological study of surfers. Author BLOGmaidenPosted on November 21, 2011 November 9, 2014 Categories articles, audience, communication, concert, culture, research, travel, videoTags Hawaii, Maui, musicians, performers, Srinivas Rao, surfers, Utrecht1 Comment on Surfers and Performers: a parallel universe? Singer / guitarist Jimi Canha and keyboard-player Gilbert Emata visit Maui College with their music. Karyn Sarring invites Anne Ku to hear them in her piano and voice classes. “You’re the third accountant I know who has become a full-time professional musician,” I said to singer/guitarist Jimi Canha over lunch this afternoon. But I had more things in common than the accountant and Filipino teacher connection. 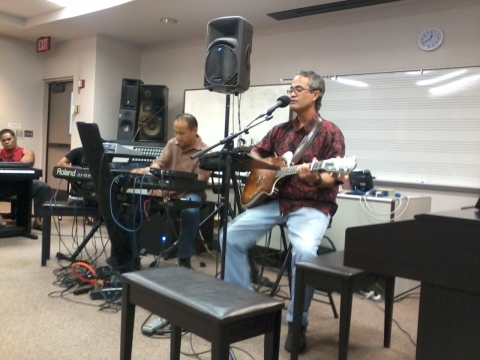 Gilbert Emata and Jimi Canha are a duo — a keyboard and guitar/voice duo who plays regularly on Maui. On Thursday evenings, they play at the Grand Wailea. More recently they were flown to the island of Kauai to play for a Google convention. Today they appeared in three consecutive music classes at the University of Hawaii Maui College as professional musicians and guest lecturers. I walked into the second class (a piano class) around 10:50 am. The performance was in full swing. It was as if they had brought their gig from a five star hotel into a class room. The front was set up with two amplified speakers and cables connecting keyboards, synthesizers, microphone, and other equipment. In between their songs, Karyn Sarring, who teaches the piano and voice classes at the college, interviewed the musicians. Jimi Canha told the story of how he learned music by ear and very quickly too. If a guest requested a song he didn’t know, he’d learn it overnight to play it the next day. At college he took a slack key guitar class but otherwise he was mostly self-taught — on the guitar, trumpet, drums, and keyboards. He worked as an accountant for some 20 years before turning his part-time hobby into a full-time profession. Once the original keyboard player for Ekolu, Gilbert brought the synthesizer to the group. When he left, Ekolu replaced him with two horn players. Since then he has played with various groups. His recording credits include Uncle Willie K’s red Christmas CD and also a forthcoming blues CD. As he introduced his bass keyboard, main keyboard, synthesizer, drum kit, and speakers that altogether gave him a full band sound, he played riffs that I recognised immediately: the Hammond organ and a familiar rock and roll sound. The grand piano and a nostalgic melody. The bass and drum kit producing a rhythm that made you dance. Here was a musician with an obviously huge repertoire and an ability to follow and accompany anything and everything. It’s the typical and most asked question of any musician who wants to perform. Jimi replied,”You start by playing for free. Play for your church. Play at family gatherings.” In other words, don’t expect to be paid when you first start out. Gilbert added,”We had a guy from the Big Island come to our gigs. He watched us. Then he asked if he could sit in with us. We heard him. Now he plays four nights a week.” In other words, you have to be heard. Show up. This was an informal audition. In a nutshell, the music scene is small on Maui. Everybody knows everybody (who is a musician). Jimi describes good musicians as those you can “see their heart through their music.” He played the Tahitian drums with a fire knife dancer during Uncle Willie K’s 15-minute performance in the Oakland Raiders football game. It was a great opportunity to share the aloha spirit — the essence of Hawaiian music. It was 3 pm. Lunch was over. Gilbert and Jimi had given most of their Wednesday to eager students and two teachers. Karyn had another class to get back to. I was grateful to be invited to hear two local musicians share a sample of their vast repertoire, from reggae to jazz, from pop to rock. Until my own piano guitar duo returns, I am rejuvenated by the musicianship in theirs.